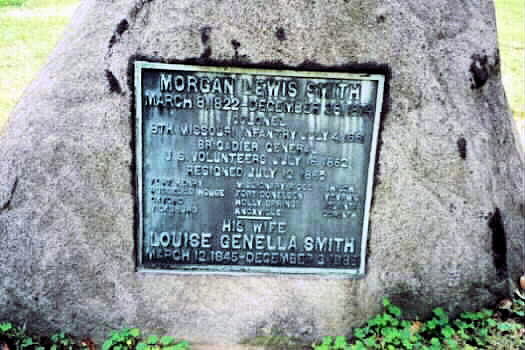 Morgan Lewis Smith, the elder brother of General Giles A. Smith, was born March 8, 1821, in Mexico, New York, but as an infant was taken by his parents to Jefferson County, New York. He left home when he was twenty-one and became something of a wanderer, occupying himself successively as schoolteacher (in New Albany, Indiana), professional soldier in the Regular Army for five years under an assumed name, and river boatman on the Ohio and Mississippi from 1850 until the outbreak of the Civil War. At this point, Morgan Smith recruited and organized the 8th Missouri Infantry, composed largely of rowdies from the St. Louis waterfront whom he turned into excellent soldiers. He was the regiment's first colonel and served as such until he was assigned to brigade command in the assault on Fort Donelson. His brigade of Lew Wallace's division was heavily engaged at Shiloh; its only casualties were dead and wounded men - a testimonial to his ability on a field where thousands of skulkers went to the rear. 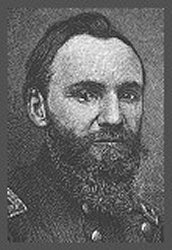 Morgan Smith was advanced to brigadier general on July 16, 1862, and at year's end was so badly wounded at Chickasaw Bluffs that he was unable to return to duty until October, 1863. At the battle of Chattanooga in November he commanded the 2nd Division of the XV Corps and during the Atlanta campaign the next year was in temporary command of the corps itself while John A. Logan was commanding the Army of the Tennessee after the death of James B. McPherson. Soon after, Morgan Smith became incapacitated for further active service in the field because of the aggravation of the wound received at Chickasaw Bluffs. After returning from sick leave, he was assigned to the command of the District of Vicksburg, where he remained until the end of the Civil War. Not waiting for muster out, General Morgan Smith resigned his commission on July 12, 1865, which probably accounts for his failure to receive a brevet promotion to major general. President Andrew Johnson appointed him United States consul general in Honolulu, where he served until U. S. Grant took office. He then engaged in business in Washington: he acted as counsel for claimants against the government, bid on mail routes in the South and West, and was connected with a building association. He died suddenly on December 28, 1874, while on a trip to Jersey City, New Jersey. Morgan Smith was buried with full military honors in Arlington National Cemetary, and you can read the details of his military career on the Arlington National Cemetery website.